Have you ever looked inside a macro tube to examine the optics there? haha. No optics, it is just a big tube filled with air. * This is why it is an extremely easy device to replicate. Maker Vinnie Hirt used the macro tube quality of nothingness to build his own set of an uber extension tube for a mere $5 give or take. The Ice Light by Westcott is a $450 light source that many photographers swear by. It is a powerful, variable LED light that can be hand held and gives a nice directional strip-like spread. Then again, it costs $450, which is no peanuts. 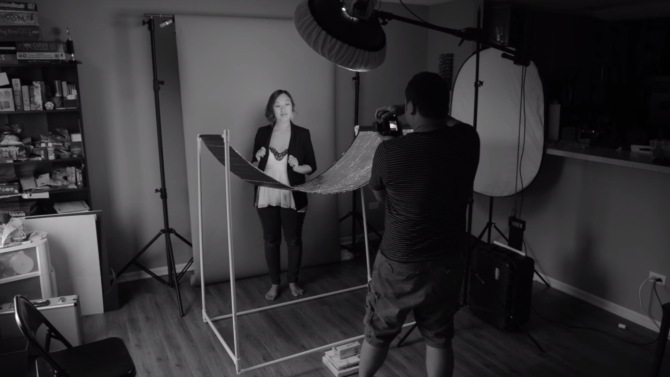 If you are in the photography stage where you have more time than money, photographer Justin Barr made a DIY version that looks pretty nifty. Details, after the jump. I’m always looking to add new light modifiers to my home studio but name brand products are often too expensive. I still cannot justifies a big expense for a single look so $300 for the Wescott Eyelighter was not a reasonable purchase for me. Plus looking at the components I felt it could be made for pennies on the dollar, look almost as nice and most importantly give me similar results. Being the handy man type I’m prone to DIY just about anything and as long as my wife doesn’t complain about the look or build quality. She’s happy, I’m happy; such is life. And since I’m the spender in this family keeping her happy is my path to more gear. When it comes to building a studio at home it is always a challenge to use space in an efficient way. Movie maker Extraordinaire Chad Bredahl of krotoflik just release a new video covering many aspects of space (and budget) optimization when setting up a home studio room. Using a clever combo if cheap lights (4 of them) and a bunch of Styrofoam from Home depot he was able to create a high end looking studio good for medium shots. I really like the way this guy thinks in terms of using available materials and making the most out of them. We all love getting our hands dirty with studio lighting equipment. Here is everything you’ll need to get a studio going. All the modifiers are DIYed so mark the next few weekends as taken. Click each image to get to the relevant project page.